When you visit the Aran Islands, don’t miss the amazing stone forts. The forts are spectacular pieces of prehistoric architecture. There are seven stone forts all over the islands. Two of them, the Black Fort, and Dún Aengus both on Inishmore, snuggle right into the cliff edge. 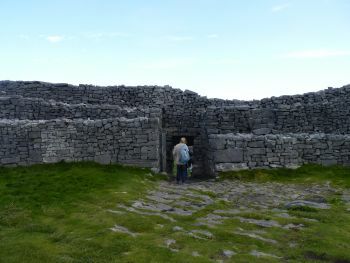 Join us here on a walk to Dun Aengus Fort on Inishmore. 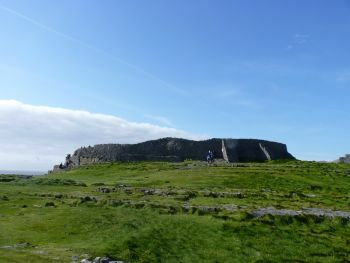 Dun Aengus is the best excavated fort and hence the one we know the most about. It dates back to 1500B.C. The dig has shown that since then, people were living in the innermost part of the fort. The outer enclosure, and the defensive structure, the so called ‘chevaux des frises’, were added on at later stages. What Was The Fort Used For? Forts were defended living quarters but they, or the site where they were built, may have also had ritual significance. Inside the fort, in the inner enclosure, there would have been houses, built of timber and wattle, sometimes stone, and thatched. Cattle were housed in the outer enclosure. I think of forts as the pre-historic version of walled towns. Typically, forts would be complete enclosures because they were built for protection from the elements, from wild animals, and from the enemy. This has led some people to believe that perhaps a large part of these forts may have fallen into the sea as the cliffs eroded. Assuming that Dún Aengus was a circular structure to start with you would be talking about an enormous amount of cliff that would have had to have been eroded away, all in the space of 3,500 years. Granted, limestone is a relatively soft rock and the Atlantic is harsh. But, perhaps, did people really live in a fort that was open towards the Atlantic Ocean? Here is another idea...perhaps the original shape of those forts wasn’t a circle...Forts of other shapes do exist in Ireland, for example rectangular forts (like Dún Fearbhai on Inish Meain), and oval forts, and also...D-shaped forts. So, is it possible that Dún Aengus and the Black Fort might have been oval or D-shaped with the flat side of the D bordering on or very near the cliff edge? There are accounts of parts of the Black Fort falling into the sea in the 19th century which makes it clear that there is some erosion going on. Geologist Michael Williamson spent some time researching the two cliff edge forts on Inishmore, the Black Fort, and Dun Aengus. He believes that erosion is a huge issue on these islands, much bigger than you'd imagine. He has calculated that over the period of time ssince these forts were built, the coastline at this point of Inishmore has been eroded more than a kilometre deep! In that case, you'd be talking about forts that were circular as tradition had it, and that were located well inland. Early Christian monks in Ireland were scholars and illustrators (‘illuminators’) of amazing books such as the world-famous Book of Kells. In early Christian times the Aran Islands were an important monastic centre with a training monastery, and part of a pilgrimage route to Rome. In those days, monks often sought solitude in extreme living conditions, such as those of the small rocky islands of the Atlantic. St. Enda’s monastery near Killeaney on Inishmore which was founded in the 8th century, trained St. Brendan the Navigator who is said to have sailed to America in a leather covered currach boat, it trained Saint Ciaran of Clonmacnoise, Saint Columcille of Iona Island and other important figures of Early Christian Ireland. Many saints are buried here at Saint Enda’s. There is an old Irish belief that you will be cured of illness when you sleep on the bed of a saint, and St. Endas monastery features a saints’ bed as well as a holy well. You can find small roofless stone churches on all the islands, all dating back to that era. They would have had thatch roofs much like the old cottages you can still see on the islands. 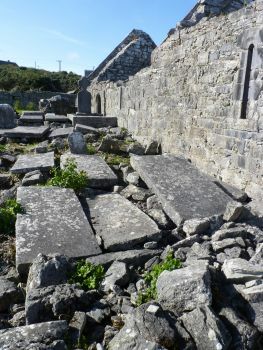 Another example of an Early Christian site, also on Inishmore is the Seven Churches (Na Seacht dTeampall) on the road between Kilmurvey and Bun Gabhla. The site has two churches and five dwelling houses. It was used as a pilgrimage place on a route to Rome between the 8th and 13th centuries. It was as important as Saint Enda’s monastery. You will see gravestones, many of them ancient, remains of high crosses, and the unique small pilgrims hostels which are buildings adjacent to the main church. You will know by now that I always like to think about what things were like for the people living back then: Imagine these places as they would have been during their heyday, bustling with action. Robed monks rising before dawn and practising their rites, farming, fishing, and vegetable gardening in nearby fields to feed the population of the monastery and its international pilgrim visitors. See how the Early Christian sites snuggle right into the landscape of the Aran Islands? They allowed the residents amazing views of the sea and surrounding countryside. To experience the power of nature was deemed important to instil humility, a core element of their religious experience. In the cruel times of Cromwells’ rule, Inis Oirr was used as a concentration camp of sorts. Cromwell wanted to rid Ireland of Catholicism. He sold the younger part of the Irish clergy into slavery. The elderly Catholic clergy were sent to Inish Bofin and Inis Oirr and kept there under guard. Contact with the population was forbidden. During the Great Famine of the 1840’s the Aran Islands were one of the few places in the country that survived pretty well because the population was used to fishing and eating seafood. This helped to make up for the loss of the staple. Who Owned The Aran Islands? The ownership of the islands changed often, but throughout the centuries, the islanders never got to own their own piece of land until 1922. Inis Oirr has a castle dating from the 15th century, O’Brien’s Castle which overlooks the island. 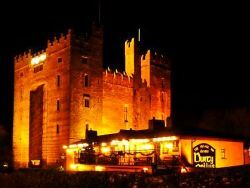 It was built by the landowners, the O’Brien’s of County Clare, descendants of Brian Boru, the first high king of Ireland who defeated the Vikings at the battle of Clontarf. The O’Brien’s ruled over all three Aran Islands. Later they got into a dispute with the O’Flaherty’s over the ownership of the islands, and as a result Queen Elizabeth I intervened and took over ownership, such was the military and strategic importance of the islands to anyone who wanted control of Galway Bay. In 1588 the Aran Islands were sold by the English Crown to the Lynch family, one of the Galway Tribes. They had to keep soldiers on the island as part of the deal. Cromwell eventually dispossessed them because they had been supportive of the Royals. After that, the islands (like much of Ireland) were owned by absentee English landlords that the islanders had to pay rent to. 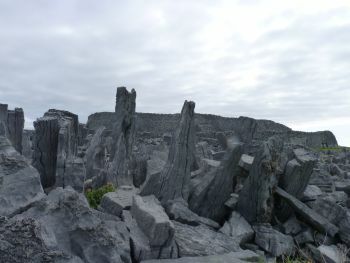 Hi there, if you enjoyed this page on the history of the Aran Islands. If you like what we do on this website, why not tell your friends about us so that they, too can find our website and enjoy the content we provide. Thanks so much for your support. Warmest regards from Susanna and Colm.